The municipality of Gerusoppa is located about 30 kms from the well-known Gerusoppa Falls on the banks of Sharavathi river in Honnavar taluk . Gerusoppa is 25 km from the outlet of Jog Falls—a long time ago functioned as the capital of the Salva empire that reigned over the region between 14th and 15th centuries. Acknowledged to have trade interactions with Europe, the Middle East and Africa, the empire reached its pinnacle under the supremacy of Rani Chennabhairadevi. She governed over contemporary Dakshina Kannada, Udupi, and Uttara Kannada for 54 years: the lengthiest reign by any Indian woman head of state. Though it was the capital of the Saluva empire, it became famous for the duration of the rule of Queen Channabhairadevi (1548–99 A.D.) famous as the Pepper Queen. (After the fall of the Vijayanagara empire, Queen Chennabhairadevi handled the Portuguese very diplomatically, who nicknamed her ‘Raina de Pimenta’—the Pepper Queen.) 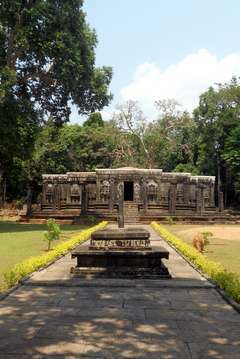 Ikkeri chief Hiriya Venkatappa Nayaka defeated the queen and Gerusoppa was abandoned and came to ruins. Frequently suggested to as the ‘Harappa of Jains’, Gerusoppa is institution to several basadis (Jain temples) with exclusive architecture, hundreds of inscriptions, groups of temples and structures that were all in the past part of an overseas trade hub. Currently, unfortunately, most of them have either been hidden under centuries of earth or endured as ruins, absorbed by the dense forests of the Western Ghats. The history of Jainism in South India and its influence on the life and thought of the people is a fascinating subject. No topic of ancient South Indian history is more thought-provoking than the origin and development of the Jains who, in times past, intensely affected the political, religious and literary establishments of South India. 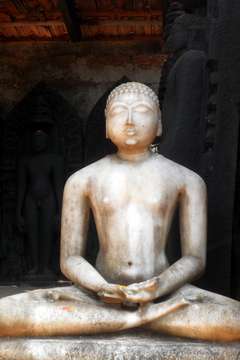 It has occasionally been thought that an associated account of the Jains could not ever be written. Situated deep inside the evergreen Sharavathi valley on the stores of the Sharavathi river, neither the sanctuaries nor the antique town can be accessed without difficulty. While Jain believers crowd the place in large numbers using private vehicles, the villages are more or less off limits to tourists due to an absence of publicity and information. Previously known as Haive, Gerusoppa was afterwards named Nagar Bastikeri and subsequently Ngaire. Formerly a famous center of trade and commerce, Gerusoppa was ruled by the Saluva kings. While Honnavar functioned as a harbor for internal trade, nearby Bhatkal was celebrated as an intercontinental harbor. The Saluva kingdom reached its zenith under the regime of Rani Channabhairadevi, who ruled between 1554 and 1603, and hailed as Mahamandaleshwari. Living the followers of Jainism, the queen organized the creation of the historic Chaturmukha Basadi in 1562. With several ship-loads of pepper and spices being methodically traded to the west, Gerusoppa was often the sticking point between numerous princely states. The rulers of Keladi were frequently at war with Gerusoppa for jurisdiction over the expensive province. Moreover, Channabhairadevi had gone to war with the Portuguese, who attempted to grab the ports and take the reins of the spice trade. Two times, once in 1559 and then again in 1570, the queen efficaciously crushed the Portuguese maritime force with her military stratagem. Chaturmukha Basadi is a Jain temple unique in its plan as it is open on all four sides (chaturmukha). It is also called Sarvatobhadra in silpasatra texts. Such temples are unique. The Chaturmukha basadi has a garbhagriha, antaralas (vestibule), navarangas and four entrances with flight of steps. The entire temple is built on a cellar which is in the shape of a star and provides open circumbulatory passage. The outer walls have ornamented niches some of which have gods and goddesses. There are some jalandhras also. 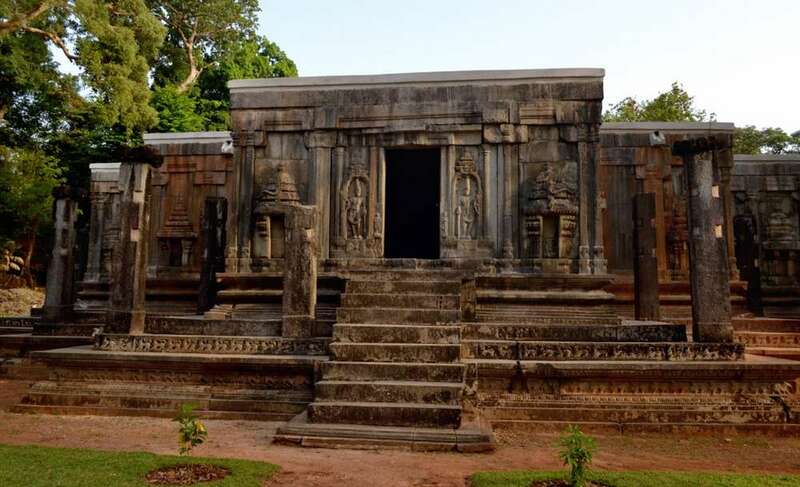 The four access doorways are alike and seated tirthankara is carved on the lintel. On either side are found the high relief sculptures of dvarapalas well bedecked and standing in dvibhanga. 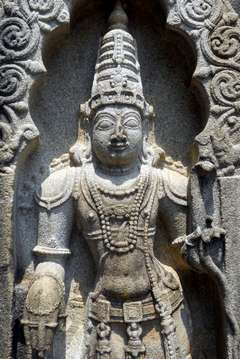 The devakoshthas with Dravida and Kadamba Nagara sikharas contain sculptures. Now there is no roof over the whole structure. The interior of the Chaturmukha Basadi has navarangas with four prominent pillars in the centre of the enclosure. Thus the sixteen pillars of the Vijayanagara type measure about 10 ft in height. Navaranga is separated by the antarala with a very thick wall. They also have decorated niches to house gods and goddesses. The three lintels of the doorways have seated tirthankaras although the southern doorway has Gajalakshmi on its lintel. Then there are four antaralas each of which has two decorated pillars. Thus there are eight such pillars. The sole garbhagriha has four seated tirthankaras each facing a different direction. This gives a meaning to the structure fronting four directions. These four tirthankara sculptures are made of black stone and have high glossy polish. There are no historical chronicles to know the patron of this exclusive Jain temple. But it is commonly judged that Queen Channabhairadevi built this temple. Even the contemporaneous explorer Pietro Della Valle is silent about it. From the stylistic substantiation this temple may be dated to sixteenth century A.D.
Acclaimed as an architectural marvel, Chaturmukha Basadi was built by Rani Chennabhairadevi back in 1562. Constructed in granite, the Basadi has remained out-of-bounds to sightseers. Constructed in the Vijayanagara style, the basadi has four entrances, one in each of the four compass points, all fronting to the sanctum sanctorum. Though no official prayer rituals are done at the Chaturmukha basadi, the Parshawanatha basadi, or the Neminatha basadi, recurrent prayers and pooja services are organized at the close by Jwalamalini temple. Superb info. Thx for sharing.